I firstly must admit to liking this book against my better judgement. 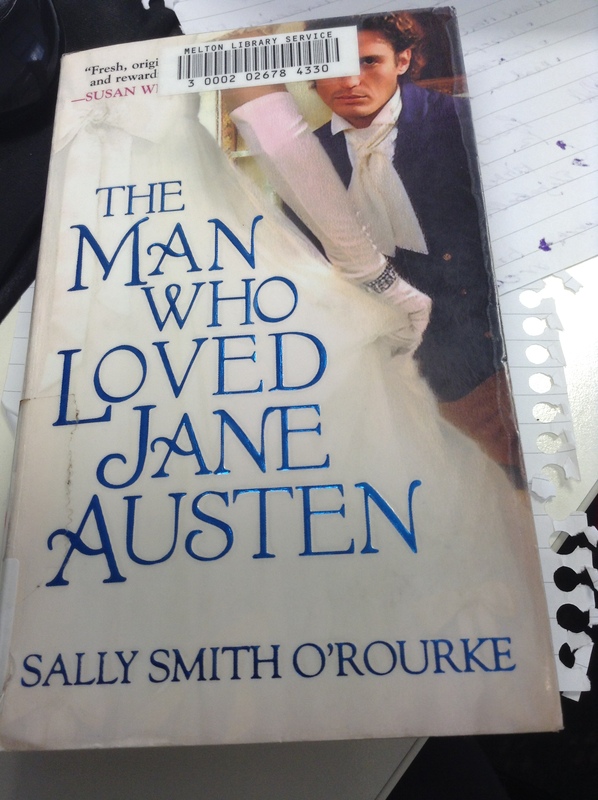 I found a paperback version of Sally Smith O’Rourke’s The Man Who Loved Jane Austen ISBN: 978-0758210371, along with six other Jane Austen-related reads, at my local library (Melton). The small paperback was the second I began reading out of the stack, and I was quickly hooked. The book centres around the one premise, which many of us have asked at one time or another, are the characters in Pride and Prejudice based on real people? And, specifically, was Mr Darcy real? When American artist Eliza Knight buys an antique vanity, she quickly (as in, within two pages of buying it) finds an old sealed letter that could prove that not only was Mr Darcy real, but he was also Jane Austen’s lover. It sounds preposterous. It pretty much is as it sounds. But we’re quickly sucked in to Eliza’s story as she takes the letters to an exhibit for testing and ends up at the estate of a real Fitzwilliam Darcy, at Pemberley Farms. The story quickly gets even more ludicrous from there, with time travelling and characters’ inabilities to understand what is going on around them, as well as full Regency balls with authentic everything (including light fittings). This little romance novel covers a lot of ground. Despite the absolute unbelievability of any of the book, and not just because of the storyline, it was actually a pleasant read for the train. It doesn’t take up a great deal of brain power to hack through and would be the perfect accompaniment for any beach trip or quick evening chick lit read. It powers through the story quickly, leaving plenty of unanswered questions, and holds attention fairly well. My main issue with the book, and why it hasn’t soared in my favourites list or my ‘to purchase’ list, is that it is far too contrived. I’m thoroughly happy to suspend my disbelief for novels – particularly Pride and Prejudice reimaginings – but I expect there to be at least a sense of authenticity. This was just too ridiculous. Eliza, a confessed Jane Austen fan if not obsessive, has never heard of a rich multimillionaire socialite horse breeder called Fitzwilliam Darcy of Pemberley Farms who, apparently, filled English newspapers after his disappearance and subsequent reappearance in full Regency garb two weeks later? Unlikely. This Fitzwilliam Darcy contacting Eliza on the internet due to the one question “Is Mr Darcy real?” believing it different to what he is usually asked? Seriously? This is one thing I see continuously plastered on Austen fandom boards online. Similarly, both Eliza and Jane believe Darcy’s time travel story with way too much ease. Regardless of how much attraction one feels for another, if someone started telling me they’d time traveled into my life I would tell them where to go and not much short of some serious scientific testing could change my mind. There were also a lot of “something could happen” plot twists, such as the letters potentially being stolen by the analyst, or her boyfriend turning up to confuse her situation with Darcy – a boyfriend who she carelessly casts off within the first few chapters only to never been seen or mentioned again. There were just too many missed opportunities to throw something in the mix here, and none of these were explored. Isn’t it just convenient that our Darcy falls in love with the bearer of the letter, happens to be stinking rich and handsome, oh and kind and generous like no one else? 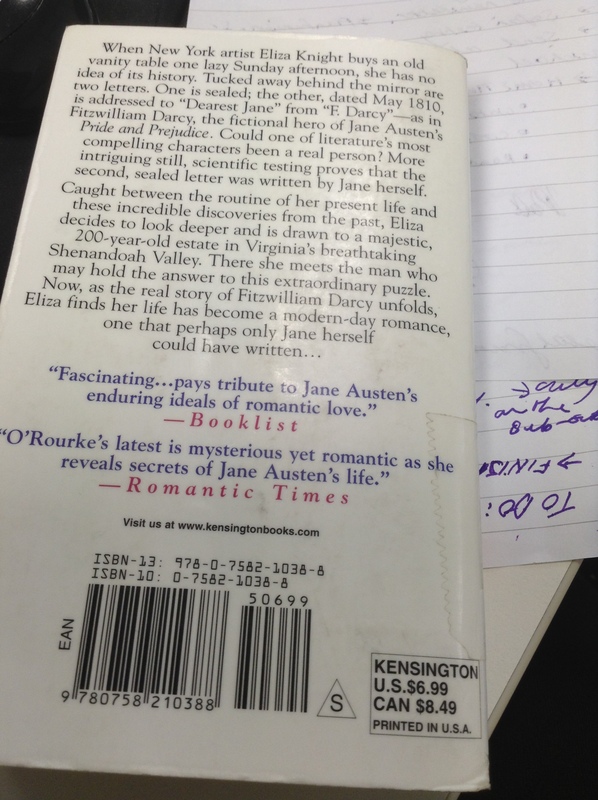 I also felt that the retelling of Darcy’s time traveling back to Jane Austen was remarkably underwhelming. While I did like the moments he underestimated Regency people – particularly of groom Simmons – and the glimpses into Jane and Cassandra’s relationship, there was nothing really revealing about Jane and her thoughts. I also found the last we hear from Jane Austen, when the letter is finally opened, a huge let down and unbelievable from the Austen I know and love – with her biting wit and alternative way of viewing her world. Despite this, and the author’s apology in her note about perhaps letting her imagination run riot, there’s much in here for Regency fans to enjoy. While the Rose Ball is ridiculous, as is the entire concept of his family tree and this great-great-something-grandmother of his having waited in a bath of petals for her lover each night, it’s good fun. Who doesn’t want to see their characters get primped up and dressed up for the occasion, and try on authentic Regency costumes? It’s also fun to speculate on what you’d do if you did find a Jane Austen letter. While Eliza expresses an amazing self control in not opening the letter to read it, I’m not entirely sure I would be able to do so myself – nor to nod off to sleep at awkward moments when a freaking Jane Austen letter is just sitting right there in my house… sometimes I think she doesn’t quite grasp the gravity of the situation! My other point of huge interest was the dollar figure placed on the unopened letter. While, personally, I can’t see why it would cost more if it’s unopened (although some will pay for mystery, surely anyone at this sort of price category is more doing it for an important collection) it was interesting to see a $1.5 million (US) price tag placed on the letter. For comparison’s sake, a first edition Emma – which Jane Austen hadn’t even necessarily seen – believed to be the last of its kind surviving, went for £200,000 at auction in late-2012. That’s about $330,000 (US) by today’s conversion rates. Funnily enough, that was a Sotheby’s auction – which is the same suggested by the book itself. Unsurprising really, considering they do many of the most important auctions – including Jane Austen’s ring, which recently secured £150,000 plus after the Jane Austen House Museum poured its heart out to the public to help beat Kelly Clarkson’s bid (she has been seen in photographs wearing a replica of the ring). In terms of handwriting, and her actual pored-over work going for sale, a significant auction of unfinished partial manuscript The Watsons, expected to fetch £300,000, actually went crazy in 2011 and was bought by the Bodleian library at Oxford for £993,250. Today’s conversion rate equivalent for $1,500,000 (US) comes to £902,907. So is $1,500,000 just way overshooting or undershooting the mark? It’s hard to say, and it’s hard to know whether O’Rourke contacted Sotheby’s or some other expert for assistance in the valuation – and if there was proof that Mr Darcy existed… well… the sky might just be the limit here. Considering the book was written in 2006, and Jane Austen appreciation appears to be a forever increasing snowball-effect style fandom, perhaps this price may have appreciated over the past eight years as well. Lastly, while we may scoff at the concept of finding a Jane Austen letter – I remain hopeful. After February’s finding of a scrap of Jane Austen’s handwriting in another book at the Jane Austen House Museum, it seems there may be many more treasures circulating. I truly hope there will be many more discoveries in the future. There’s also a sequel, called “Yours Affectionately, Jane Austen”, which O’Rourke was recently doing a giveaway of on her blog. I will read it if I come across it, but am unlikely to seek it out. As with many fanfiction style novels, there are just too many different techniques in this book – pure time traveling, or pure romance or pure letter-finding situation would have been fine, but all together is a bit of a mess, as I have frequently pointed out before with other authors that just try to attempt way too much in one go. Have you read it?